CaliGirl Collars on Etsy. I absolutely loved Ilka's CaliGirl collar. Buttery soft from the get go, and fancy without being being blindingly blingy. Most are in the $45 to $75 range. Oh, I always liked Ilka's collar too! And she doesn't have anything green, but she does have orange (another favorite collar of my husband's). Maybe we'll see about getting one of those! Collarmania is having a 25 % off sale starting the 20th of this month. At the size you want you could get a nice nice collar for around $20 at this sale. Check out their new cork collars. Last edited by GingerGunlock; 03-13-2019 at 08:00 PM. I know she would replace. She is very personable. I don't know anything about the cork. That is new, but I have one in my cart ready to buy. So I know I'm not doing anybody's wallets any favors but resurrecting this thread but....I'm having a hard time finding 10 month old Ulrike a good "teen" collar? Like, I don't want to shell out the way I would for her Big Girl Collar, her neck right now is like, 14 3/4 inches, and I'm having a hard time finding something that is leather, not $60+, and somewhere in between covered in rhinestones, etc (this little barbarian is not a rhinestones kinda gal) and plain as plain can be. Back it up...do you have a new dog??? Also, heck yes to Collarmania, except...her wait time is a bit long right now, because she is SOOOO popular. But you would absolutely have no problem with the hardware. It will hold up, no problem. I've sent mine through all kinds of stuff. You might try Penelope's Playtime...she's on Facebook. I've heard good things from several friends. I thought you were using one of the nylon flat collars with an imbedded prong? If anyone is using one of these I have a friend who is looking for one pm on line (there are a couple of vendors that are usually at the shows but we are kind of between local shows right now). So if you, or anyone has a link for one of the prongs that are hidden in what looks like an ordinary flat nylon collar please post it here. If you choose the "Keepers Favorites" hidden prongs those typically ship quickly, as opposed to the custom made options. I got mine within a couple of weeks, tops. I've also used a Lola Limited in the past, and didn't like it nearly as much. I love my hidden prong collar from Keepers. Also, got the matching leash. Well, unfortunately a lot of Baron's collars are not a match for Smiley Miley but there are some that she will inherit! So, the madness has begun for Miley. Have 2 Collar Mania's ordered from the recent sale, a Koklati from her spring collection, and working on an EL for her. It's a start! This was a gift from Lisa from Collar Mania when we brought her home! Pink Minky glitter! y'know....I guess I never announced that did I. Another thread is probably in order! Yes, I use a Lolas Secret Power Prong. But of course, that is only for walking. The rest of the time McCoy and The Sheriff roll "naked". That unless he is dressing up "Western"! All collars are made to order. 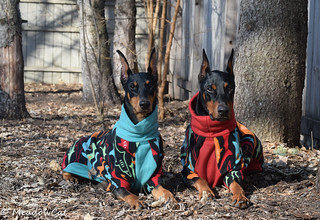 She initially made them, I believe, with her Dobermans in mind. she was trying to avoid the public stigma of having a Dobe on a prong. When on leash these training collars look just like a Martingale. Okay, the clock is ticking!!! Photos photos photos required ASAP because you know we are dying to see them! How do you pronounce the name? Wow, you RASCAL! Dang--I knew I remembered you saying you walked McCoy on one of the hidden prong collars. I'll pass that information along too. My dogs have never worn collars except when out of the house--at dog shows etc. The breeder of my very first Dobe yelled at me in a Drill Sgt tone of voice when he realize my dog had a collar on and it had left a 'mark' (worn the hair some) on his neck. That practice ground to an abrupt halt and even though I ultimately (years later) found a slip collar that would not leave marks on a dogs neck even if they wore it day and night--like your dogs rarely have a collar on at home. My dogs run around nakey at home too! But I also love cute collars, so much so I started making my own! It's pronounced "ull-reeka" and here look, I made a whole thread, forgive me? "Late intro: meet Ulrike!" triciakoontz, Control_Freak and 4x4bike ped like this. Fusion by Design is having a March Madness sale on all their models, 20% off until midnight tonight. I have been drooling over the Moana for some time, and I am trying so hard not to get one with the sale. Especially as I got one of the new tag collars for Nadia last month cause we both have February birthdays. Ooh thank you, I'd never heard of them previously! I LOVE this collar and I'm lucky that it's too big for Ulrike because even practicalities like "how well will a hand painted collar wear, anyway?" apparently only sometimes enter my mind: Inspired "Ocean Tide"